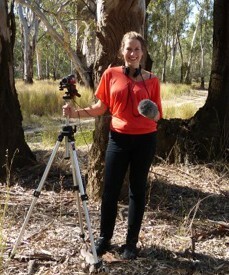 Jessica Tyrrell is a freelance media producer and practicing media artist. With a BA in Communications (Hons1) from the University of Technology Sydney, she specialises in video production such as camera operating and sound recording, as well as a range of video postproduction including digitisation, editing and DVD production. Recent clients include the Powerhouse Museum where she edits oral history interviews for the Migration Heritage Centre website, Woolcock Institute, Performance Space and NSW National Parks and Wildlife Service, as well as a host of independent businesses. As a media artist Jessica works across installation, audiovisual performance, sound, video, online and interactive media. She is currently undertaking a PhD at the University of Sydney researching the potential of reinterpreting oral histories in the context of interactive audiovisual installation art. Jessica began collaborating with Sue Rosen as part of her PhD and they have since worked together producing video oral histories.